Robert E. Rossi passed away Wednesday, March 20, 2019, at Atrium Medical Center. He was born in Middletown on October 14, 1930 to parents Carl and Lelia Rossi. Bob graduated from Monroe High School in 1949, where he actively participated in various sports. He was a veteran of the U.S. Army and was honorably discharged. He retired from Inland Container after 38 years of service in various Managerial positions. After retirement, he and his wife had many enjoyable traveling experiences. Bob was a successful entrepreneur in real estate and was known for his integrity in his relationships with people, considerate and always thinking of others. He was a kind, generous and loving person, always putting others first. He was an avid outdoorsman, enjoyed sports and participated in numerous golfing, hunting and fishing trips. 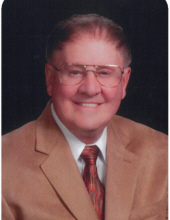 Bob was a member of Brown's Run Country Club and an avid golfer. He was also a long-time member of the NRA and Ducks Unlimited. He was a member of the former Faith United Methodist Church for 75 years, where he actively served on numerous committees. After Faith Church relocated, he faithfully attended First Baptist Church on Riverview. Mr. Rossi is survived by his loving wife of 58 ½ years, Thelma Rossi; brother, Carl (Nancy) Rossi of Ludington, Michigan; sister-in-law, Charlotte (Chester) Collins of Middletown; and numerous nieces & nephews. He was preceded in death by his parents and sisters, Patricia Rossi Pleak & Dorothy Rossi Goodwin. A special thanks to Dr. Wourms and his staff, nurses, extra-special caregivers and exceptional therapists. Memorial donations may be made to First Baptist Church of Middletown, 4500 Riverview Drive, Middletown, Ohio 45042 – OR - Spring of Life Worship Center, 2001 Brell Dr., Middletown, Ohio 45042. At Bob’s request, a private funeral was held March 23, 2019 with Rev. Chester Collins and Rev. Tim Draxler officiating. We appreciate all the love, support and prayers of our family and friends. To send flowers or a remembrance gift to the family of Robert E. Rossi, please visit our Tribute Store. "Email Address" would like to share the life celebration of Robert E. Rossi. Click on the "link" to go to share a favorite memory or leave a condolence message for the family.